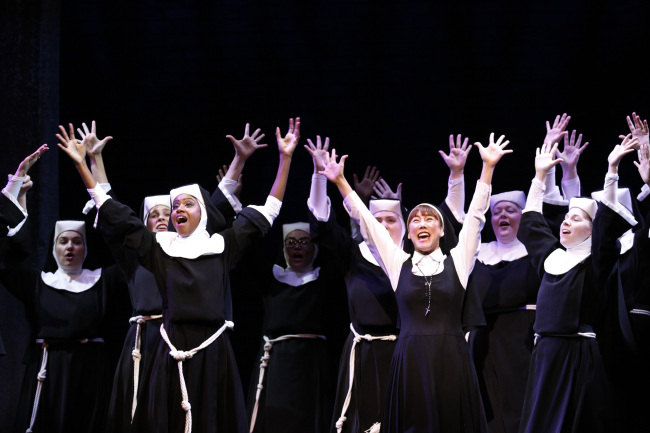 The US production of the musical “Sister Act” has landed in Seoul, the final destination of its Asia tour that commenced in May. The Korean segment of the tour premiered Saturday in front of a sell-out crowd at Blue Square in Yongsan-gu, Seoul, and will run through Jan. 21, 2018. Based on the 1992 hit comedy film starring Whoopi Goldberg, the plot revolves around the singer Delores who witnesses a murder and takes refuge in a convent. While the plot may sound dark, the show is actually a light-hearted comedy filled with upbeat music. “I feel like we have a party every night. Delores is really a diva. She likes to be in the spotlight, but also has an incredible bond with the nuns,” said Dene Hill, who plays the role of Deloris Van Cartier, during a press event Tuesday in Seoul. Unlike the movie, the show is set in the late 1970s Philadelphia and uses music from the era like disco and soul. The show also stars Brandon Godfrey as Curtis Jackson, Rebecca Mason-Wygal as the Mother Superior and Will T. Travis as Eddie Souther. Godfrey, who plays a lover-turned-evil character who sets out to kill Delores to cover up his crime, said the trick was not to play Curtis Jackson as a standard villain. His efforts seem to have paid off, as “When I Find My Baby,” which he sang during Tuesday’s event, comes across as sleek and cool rather than slimy and cruel. Playing the young, timid Sister Mary Robert, her breakout number “The Life I Never Led” expresses her desire to break free from restraints -- such as the abstinence that comes with living in a convent -- and lead a new life. Cast members and Babbage on Tuesday promised the audience that they would be in for a delightfully hilarious night. “By the end, it is impossible not to be smiling. No matter what mood you’re in, you’re going to leave feeling better than you did coming in,” said Babbage. The original West End production of “Sister Act” opened in 2009 and was produced by Stage Entertainment and Whoopi Goldberg. The show has been nominated for several Tony Awards and Laurence Olivier Awards, including best musical for Tonys in 2011. Tickets for the show in Seoul range from 60,000 won to 140,000 won, and are available for those aged 7 and above. For tickets, call 1544-1555 or visit Interpark’s homepage. The show starts at 8 p.m. on Tuesdays, Thursdays and Fridays, at 3 p.m. and 8 p.m. on Wednesdays and at 2 p.m. and 7 p.m. on weekends and holidays. There are no shows on Mondays. The show is 2 1/2 hours, with a 20-minute intermission.